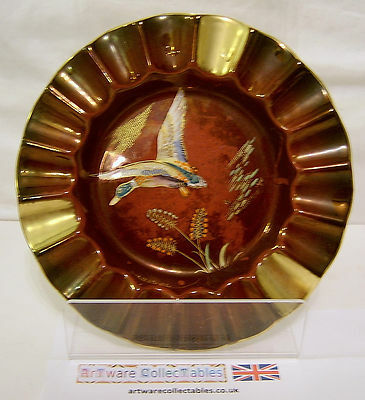 It seems a shame to stub out a cgarette on such a delightful Ashtray from Carlton Ware. Beautifully decorated in en a mels in the Flying Duck design, this piece is set on a rouge ground showing this design to perfection. The Ashtray has a fluted frilly edge with three rests in corporated into the design. It ha s a diameter of 5.75 inches (14.5 cms) and because of its original intended use, does have some light discolouration in the well of the ashtray; the rest, however, is in very good condition . It is shape number 2192.